It is with a heavy heart that I write these thoughts on the late Ronnie James Dio. I'm still wrapping my mind around the fact of his passing. He meant so much to Rock N' Roll & Heavy Metal music, more than many may realize. It was just recently that I learned his music career extended back to the late 50's! How many artists in Heavy Metal can say that? Dio's career in Heavy Metal was legendary. He had sung for several major bands; including Ritchie Blackmore's Rainbow, Black Sabbath, and his self-titled band Dio. When taken as a whole, Dio's recording career transcended decades and genres as few other artists could ever hope to match. With his return to Black Sabbath in 2006 it seemed his career had come full-circle, as the renewed comraderie inspired the band to change their name to Heaven & Hell, after the first Black Sabbath album on which Dio sang. It seemed they could have continued making music together for many more years, until Ronnie lost his battle with cancer on May 16th. On a personal level, Dio's music was an integral part of my journey into Heavy Metal music. I've mentioned before how I first became a fan of heavy music in the late 80's, embracing almost any band that is regarded today as 'Hair-Metal'. Bands like Guns N' Roses, Motley Crue, Poison, Ratt, L.A. Guns, & Whitesnake made up much of my personal music catalog at that time. Ronnie James Dio had been a rocker for many years before the Hair-Metal scene took off, and his music retained elements of classic metal that would lead me back to discover artists like Iron Maiden & Judas Priest later on. All of his many collaborations have helped Ronnie James Dio remain a relevant and influential force in Heavy Metal throughout the years. Dio has been one of the guiding creative minds of Heavy Metal from his early hard rock band, Elf, in the late 60's, to the newest Heaven & Hell album, The Devil You Know, in 2009. 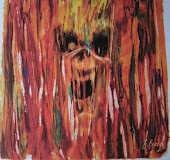 However, he is best known for his work from the 80's. It was on a compilation cassette where I first discovered Dio. 'Rock 'N' Roll Children' was a Dio track featured on a cassette compilation titled "Slave to the Metal". It was one of my favorite songs on that tape, and I made a point to look further into his music. Eventually I added albums like Sacred Heart and Lock Up The Wolves to my collection. A year or two later I discovered a new radio station that played a lot of metal, and it wasn't long before I heard Dio's all-time classic 'Rainbow in the Dark'. 'Rainbow in the Dark' is built upon a guitar riff regarded by many as one of the best in Heavy Metal. 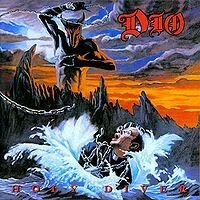 It was the best single from Dio's name-sake band's debut album, Holy Diver. This album as a whole is also revered throughout the Heavy Metal community, so I'll review Dio's iconic Holy Diver album today. To read other reviews of Dio's music on this blog, just click on the 'Dio' tag below. 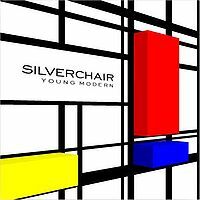 A while back, I checked out Silverchair's newest CD, Young Modern, from my local library. I was curious to hear what this band was up to these days, and I had heard a new single from them for the first time in a long while. The song was "Straight Lines". The first track, 'Young Modern Station', had a few traces of their old hard rock sound, but pretty much the rest of the album is a much more laid-back experience. Silverchair seemed to have embraced the direction of modern mainstream rock, emulating such artists as Coldplay or Five For Fighting. Taken by itself it would probably be quite enjoyable for those who are seeking out a mellow rock album, packed with keyboard & strings passages throughout. However, for those who pick up this album having Frogstomp in mind, they may be disappointed. 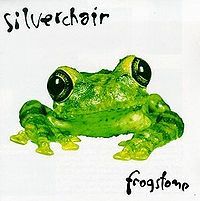 Looking back at Frogstomp, if you've just discovered Silverchair via the Young Modern album, would be equally disturbing. Back when their debut album put them on the map, the grunge scene was in its prime. Considering they were only 15 when they recorded it, you can't begrudge their reflecting the influence of the music of the times. Their debut album produced several hit singles, and they were instantly regarded as a band with high potential. Of course, in their early days it was seen as potential within the grunge/alternative genre. However, as their career evolved, it has become evident they had the potential to completely shed their early expectations for the sake of pursuing their own musical vision.